UPDATE 2050 GMT: Iraqi military officials say insurgents captured two more border crossings on Sunday. The officials said the fighteers claimed the al-Walid crossing with Syria and the Turaibil crossing with Jordan after Iraqi forces withdrew. UPDATE 0820 GMT: Al Jazeera English reports a further insurgent advance from western Iraq towards Baghdad. Correspondent Imran Khan says insurgents are negotiating with tribal leaders to enter Haditha, northwest of Ramadi. Khan said the Iraqi army has withdrawn to Khan al-Baghdadi and the Ein al-Asad military base. Insurgents made further advances in their two-week offensive in Iraq, taking three towns in the west of the country and a crossing on the Syrian border. The insurgents strengthened their position in Anbar Province in western Iraq, where they claimed parts of the cities of Fallujah and Ramadi in January, with the capture of Rawa, Ana, Rutba, and Husaybah. Al Qaim and the towns are on a highway from Syria to Baghdad, with Husaybah only 100 km (62 miles) of the capital. The fighters also moved into the Al Qaim border crossing after a day-long battle in which they killed at least 30 Iraqi troops. A police officer said 70 volunteers coming from Baghdad to support the Iraqi Army were killed in an ambush. In Rutba, insurgents drove in with 50 trucks late Saturday, burned the police station, and clashed briefly with officers before taking control, according to local officials. Al Qaim is across from Deir Ez Zor Province in eastern Syria, where the Islamic State of Iraq and as-Sham has been battling Syrian insurgents. 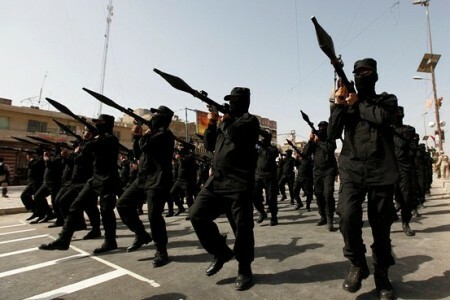 The insurgents have also taken Tal Afar in northwest Iraq near the Syrian border. The gains support their objective of a corridor in which they can move weapons, supplies, and men between the two countries. Al Qaim sits across from the Syrian border town of Abu Kamal, which ISIS has been trying to take from the Islamist faction Jabhat al-Nusra. 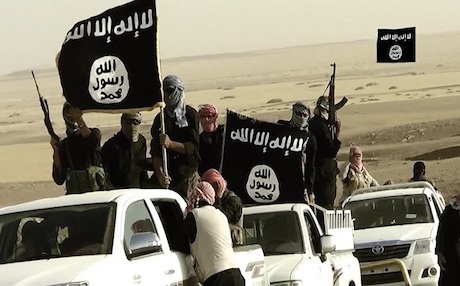 ISIS and Jabhat al-Nusra turned against each other in spring 2013 when the Iraqi group tried to claim control of the jihadist movement in Syria. The dispute eventually led to ISIS’ break with Al Qa’eda. In Baghdad, the followers of Shia cleric Moqtada al-Sadr made a high-profile challenge to both insurgents and Shia Prime Minister Nuri al-Maliki on Saturday, as thousands of supporters and militia Sadr City in eastern Baghdad. “We are following our leader to liberate our country from Da’ish. They are all terrorists,” said Haider Taha, 20 years old, as he and his friends sat with AK-47s in a pickup truck. Al-Sadr’s Mahdi Army challenged American occupation for years before the cleric focused on a political course. He has worked with al-Maliki, but has distanced himself as the Prime Minister’s accumulation of power has alienated some Shia as well as Sunnis and Kurds. US Secretary of State John Kerry has repeated Washington’s call for a “unity” government without acknowledging an American desire to remove Prime Minister Nuri al-Maliki. Speaking in Egypt at the start of a regional tour on Sunday, Kerry said the US wanted Iraqis to find an inclusive leadership to fight back against the Islamic State of Iraq and as-Sham. The United States is not engaged in picking or choosing or advocating for any one individual, or series of individuals, to assume the leadership of Iraq. That is up to the Iraqi people and we have made that clear since day one. A double bombing has struck a funeral ceremony for an Iraqi police officer in southeast Ramadi, west of Baghdad, killing 10 people and wounding 22. A car bomb exploded, then a suicide bomber detonated his explosives. The man, a Sunni fighter in the last round of civil war, stole a concerned glance at the men around him, some playing cards or backgammon. Warning shots have been fired to control long lines for gasolines, as residents report price rises of 200-250% in the last 10 days.